How Much Commission Does My Agent Make From My Life Insurance Purchase? A life insurance agent's commission depends on a few factors, including the company's commission plan and how much life insurance the agent is selling. Here is all the information you need to know to help you find out how much the person selling you your life insurance policy is making, and a few tips to help you understand what the options are when it comes to choosing who to buy your life insurance from. Are Life Insurance Agents Paid By Commission or Salary? People licensed to sell life insurance may hold several positions and compensation agreements that influence the amount of money they make. Life insurance policy sales usually give the licensed representative compensation from a commission and sometimes salary if they are contracted employees. Many people who sell life insurance work on contract so commission may be their primary source of income. We get into the details and exact numbers below. Other factors may impact how much money they make off your policy, but this gives you an idea of the reasons why one person may make more or less than another. Does Life Insurance Commission Affect Your Cost of Life Insurance Policy? Life insurance is highly competitive, and it is worth considering that for every policy sold, there were probably several that did not get sold, got rejected due to failing medical exams, or other reasons. Life insurance companies understand this, so when a sale is made the commission may be perceived as high due to the fact that the model needs to account for this. Your life insurance premium itself doesn't change based on commission. The commission is the part of the premium the insurance company gives the representative for having made the sale, and then for providing good customer service to maintain the client through several years. Some life insurance representatives may work as an agent for one company or many that base their primary compensation on commission, these people may receive a lower base salary, and are expected to generate the bulk of their income from commission. Other models of compensation may include higher salaries, and less commission percentage because of the arrangement they have made in their employment contract. If they are independent, they may even make all of the commission from the sale, however, if they work for a firm, they may have an agreement that makes it so that they are not receiving the whole commission due to the fact they have agreed to a salary instead. As you can see the answer to how much a person makes when they sell you a life insurance policy is not straightforward. However, with the right information and questions, you can find out. When you try and find out the average salary of a life insurance agent, because of the factors above, it is very hard to say. According to the Bureau of Labor Statistics, the median pay for an "insurance sales agent" is $49,990 per year or $24.03 per hour as of the latest data from 2016. Keep in mind that this specifies a sales agent, and includes data from all insurance, not only life insurance. Because of the models described above ("commission heavy" or "salary heavy") this number varies greatly, and because it is a median, it is not showing you the high end of the more established agents, or those who sell higher valued policies. If you look at the median pay for a Personal Financial Advisor, who may sell life insurance, the number is twice as high, $90,530 per year $43.53 per hour. There are different kinds of life insurance policies. The type of life insurance policy will also impact the amount of money that will be paid out in commission. The larger longer term policies will usually pay more on commission. The two main types of policy are term life and whole life or cash-value policies, also known as universal life policies. This would include survivorship life insurance policies as well. Term insurance lasts for a limited "term" or period of time, such as 5,10, 20 or 30 years. Whole life insurance lasts your entire life and it may build up cash value over time. and provide the possibility of borrowing money from your life insurance policy. How Much Commission Does the Life Insurance Agent Make? Your agent's commissions can vary depending on the type of life insurance you choose. Every company is different, but life insurance agents may make 30 to 70 percent in commission of the first year premium on term life insurance. Top ranking producers may even get 100% of the full premium in the first year as commission and 5% commission from the second to the fourth year. Subsequent year commissions may drop off or can be much lower. The amount of commission paid will vary based on the agreement the agent has with the insurance company or with their employer (if they are not contracted workers). Some life insurance agents may also get a one-time commission on top of the initial year's commission for initiating a new life insurance policy. Do You Pay More For Life Insurance If You Buy From a Broker vs. Insurance Company Directly or Agent? In all models, the payment structure for compensation adjusts for the circumstance, so you should not be paying more for life insurance if you go through a broker vs. an agent or direct through a carrier. The commissions they get are often adjusted for the circumstance and agreements they have signed. It all depends on which insurance company is offering coverage that best suits your scenario. Brokers can often get you quotes with several companies to give you a chance to compare options. When you go through the carrier directly, they will only be offering you their products. If you are worried about added fees, ask the person quoting you if there are any added service fees and shop around for your options. The one-time commission on top of the standard commission paid for initiating a new life insurance policy has been a point of concern in the industry at times. This is one important reason that before you change a life insurance policy, you always want to be cautious that you are getting the right advice. You can read more about this concern in our article about what you need to know before changing a life insurance policy, or additional related issued this article about taking medical exams when you get a new life insurance policy. Is Your Life Insurance Agent Selling You Something Just Because They Want to Make More Money? At the end of the day, how much the person selling you your policy may be deviated by what they agreed to as a compensation agreement. Two people under two different compensation agreements selling you the same policy may walk away with different amounts of money as a result. What you probably want to know when you ask the question about how much money your life insurance agent or personal financial planner is making off the sale may be more about whether you should trust them to be providing you good advice, vs. whether it is a self-motivated "sell". Worried Your Life Insurance Agent is Selling You Something Based Only On How Much Commission They Make? A life insurance agent or broker or any financial planner should never be selling you something to profit for themselves. Yes, they need to make a living, but one piece of good news is that the sale of life insurance is regulated. In order to sell life insurance one must be licensed by the state they are practicing in. The responsibility in the life insurance profession is to offer you products that fit your needs, so although life insurance can be profitable for someone selling life insurance (as with any job), the representative is supposed to be offering you products to fill your needs, not their own pockets. 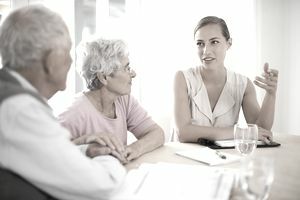 They should also be able to discuss various life insurance policy options and outline the advantages or disadvantages taking into consideration where you are at in your life. If you feel shortchanged on the advice you've received, or question whether your agent is selling you something with an ulterior motive, you can always contact the state insurance commissioner office in your state to report your concerns or contact other agents or personal financial advisors who can give you their recommendations and then you can compare your options. You should always feel comfortable with the person selling you life insurance and never feel pressured to buy something you are not sure of. Will you itemize the commissions you will get from the products you offer me? The best thing you can do is talk with your agent or a Personal Financial Planner about what is best for your situation, and if you find yourself questioning whether they are selling you something just to make money, then it might be a good idea to shop around and find other options before making a decision. It is your money and your life insurance, why deal with someone you don't trust? Learn about cash surrender value.